As concerns over climate change and our impact on the environment increases, there has never been a better time to start going green. Many businesses still believe that going green is too expensive or time-consuming, with the current economic climate adding to the notion that reduction of waste is not a priority. However, there are many simple ways a business can reduce their impact on the environment and it doesn’t necessarily have to involve drastic or expensive changes. By investing in changes now not only can it improve the profile and reputation of your business it could potentially save money through proposed tax cuts and reduced wastage. Some of the easiest ways of being energy efficient are making sure lights, air conditioning and computer monitors are turned off when not in use, using motion censored lighting wherever possible. Surprisingly, the need for air conditioning and central heating can be reduced significantly by choosing the right blinds for your office windows. By opting for insulating honeycomb or cellular blinds rather than the standard vertical or roller blinds you can drastically reduce heat loss, keeping the office both warm in the winter and cool in the summer. 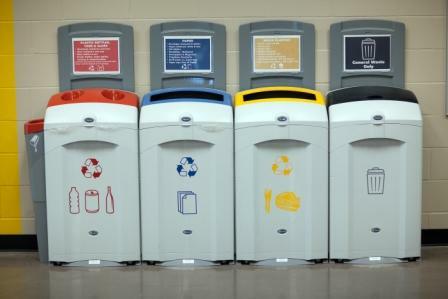 Ask your waste disposal suppliers about recycling options as you may be able to recycle anything from paper and exhibition display materials such as banner stands to broken computer equipment and hazardous waste. Consider changing to suppliers that are dedicated to reducing their carbon foot-print, as there are many companies offering environmentally friendly products and services ensuring that your supplies do not contribute to damage caused by other businesses. Although recycling is an excellent way to improving your company’s green credentials, the best way (and most cost effective) is to avoid unnecessary waste in the first place. One of the easiest ways of doing this is reducing paperwork and print-outs. If possible print on both sides of the paper, send memos via email and store documents digitally. Keep any unwanted non-confidential print-outs for use as scrap paper and use recycled paper when possible, not only will you produce less waste, but help minimize those costly stationary orders. There are many ways you can take charge of waste management, but as with any change it is most effective when everyone involved is equally committed. Many businesses offer incentives for employees to car share and use public transport, why not make it a team effort by getting your staff on board? Provide all necessary facilities for staff to heat, prepare and enjoy their lunch on-site to avoid the need to drive to local restaurants and cafes. Either provide mugs and cups or encourage staff to bring their own, reducing the need for wasteful paper and plastic coffee cups. By getting everyone involved you’ll not only boost team moral, but make the smaller changes more effective in reducing your business’s impact on the environment. Liberty-Belle Howard is a UK blogger with a keen interest in green issues. She is currently writing on behalf of Marler Haley. collected from your office weekly will be reduced and you get to learn practical measures to reuse or re-purpose various items.